Meet Fedora Dog! | Ooh Something Shiny! We didn’t last long as a dog-free house. We missed Sharkdog (Akeesha) too darn much to come home to an empty house. This is Spenser. 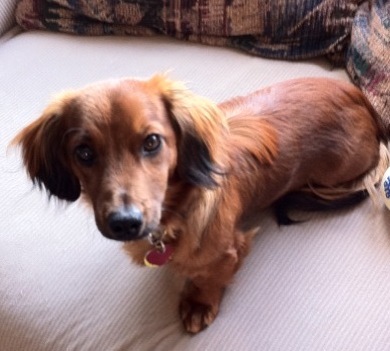 Spenser is a 7 month old long-haired Dachshund from South Carolina. He was rescued from a high-kill shelter by Furvever Dachshund Rescue. We have a family friend who is a dog lover and doxie foster in Clemson, SC. She posted his picture (he was named Bo) and the “we need to get this dog” campaign began in the Oooh Something Shiny household. My better half wanted a break from dogs, which made sense on every level, but Bo was just irrestible. Our daughter’s powerpoint pushed him over the edge. (Her mad Powerpoint Skills predate the recent commercial by about 7 years. She created a PowerPoint Christmas list when she was 12 and remains to date one of the most skilled PowerPoint users I have seen). We drove the 13 hours to Clemson on Saturday and returned on Sunday. I decided to rename him when I read that it’s a bad idea to name a dog Mo or Snow or Beau, because it’s too close to No and confuses them. I came up with Spenser after the Robert B Parker detective. One of my favorite character from one of my favorite authors. I had some selling to do on the name, but my entire potential name list was pronounced nerdy and my husband was convinced with every name that I came up with after Spenser was an attempt to come up with something even worse so that he would agree to Spenser. He looks like a Spenser though, doesn’t he? I took yesterday off for some basic training (Did you know that adopting a dog doesn’t meet maternity leave requirements??). Spenser learned his name quickly as well as Sit! and Leave It! We tried lay or down, but he keeps just looking at us like “Look, I want to make you happy and I really want that treat, but I have no idea what you’re getting at.” I’m working on Stay now and we’ll see what’s next after that. He is a really quick study. Expect many more Spenser stories to come.